Last month, the Patient Revolution team took to Twitter to host our first #WhyWeRevolt tweetchat. We want to get to know the folks who are sharing their stories and engaging in these conversations about moving healthcare to something that is careful and kind, and we kicked off our first chat by taking a look at Victor Montori's book, Why We Revolt. Our questions were centered around the language of the book and the discussion online was exciting. We have picked a few of our favorite Tweets in case you missed the chat. Enjoy the read, and if you'd like to see all of the discussion, take a look at the #WhyWeRevolt hashtag on Twitter. Our next Tweetchat will be announced soon! #WhyWeRevolt At first blush, maybe not (other than me saying things like "I love my cardiologist!" (which I do) but as the book says: 'Failure of love to prevail (in medicine) has consequences'. It's thus the absence of love in our healthcare relationships that dictates reality. Q1 A1 #WhyWeRevolt The word love does not bubble up, except in how I support my loved 1s as they support me when I need care. When the doctor who diagnosed me with type 2 stopped answering my ?’s ignored my concerns and family history, I was angry and felt neglected. Q2. When has your healthcare felt careful and kind? When hasn’t it? A2: Little things mean a lot: good: eye contact (remarkably absent sometimes - competing w. computer screen = not good). Yes ! It's this but so much more. There is this notion within adult centered care that kids growing up and surviving against all odds still made bad lifestyle choices and ended up with their defects/diseases 🙄 It's maddening ! Q2💔When it was careless, and not Pt-Centered, my son almost died - 3x that I know of. Which, if you know me, you know it haunts me. A4: I felt like a blur at a practice that I left (which led to me finding @DrDannySands). I felt like a blur at a PT practice that I left. #WhyWeRevolt NOTE: whenever a clinician treats me kindly I look them in the eye and THANK them. For making the choices to go into HC. If I’m not counting the question on the paperwork, I’ve never been asked questions on how I’m doing mentally. Maybe they think my positivity is confidence? It’s just optimism. As a mom of a T1kiddo....I’ll switch to another practice. I want my kid to EXPECT a moment of personal contact and human interaction as he grows with T1. Thanks to the engaging and inspiring discussion we had last month, we're returning to Twitter on Tuesday, August 7th for our second #WhyWeRevolt Tweetchat. This edition will take place on August 7th at 6 pm PT / 9 pm ET through Twitter. Tune into the @patientrev Twitter account for questions on August 7th, and follow the discussion via the hashtag #whywerevolt. This month, we'll be talking about digital tools and how they help, or hinder, careful and kind care. There's a lot to unpack there, and we're excited to hear everyone's take. We'd love to have you join this discussion, so mark your calendars for August 7th and we'll see you there! "Here we were, trying to care for each other, but bumping up against this rigid and uncaring system at every turn." Help us build our story library. Share your story with the Patient Revolution team. 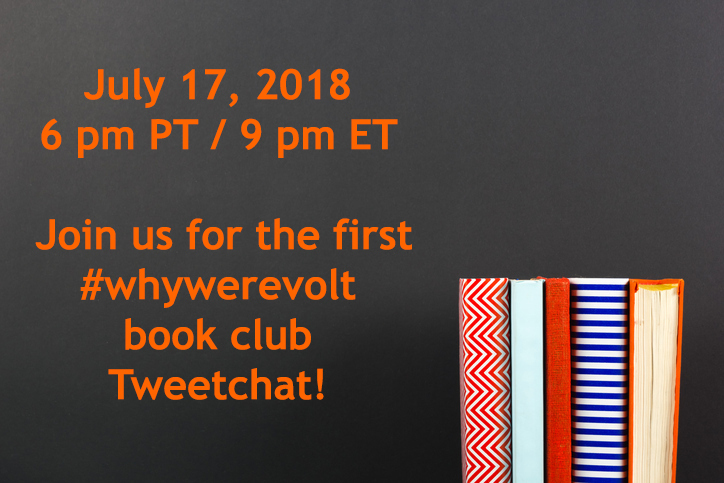 July 17th - #WhyWeRevolt Tweetchat! The Why We Revolt book club is here, and you have a chance to join - to lead! - the discussion real-time. Our first digital discussion will take place on July 17th at 6 pm PT / 9 pm ET through Twitter. Tune into the @patientrev Twitter account for questions on July 17th, and follow the discussion via the hashtag #whywerevolt. Need to grab a copy of Why We Revolt? We're proud to say that it's been selected for the Gold Foundation's compassionate clinicians reading list. Check out this link for details on how to get your copy. What's a Tweetchat? It's a moderated discussion on Twitter, centered around a specific topic and hosted by a discussion leader. Our Tweetchat will be about Why We Revolt, with a focus on the language we use to talk about healthcare and the power of careful and kind care. We'll be joined by Why We Revolt author Victor Montori (@vmontori)! This is our way to take action as individuals and to come together, sharing our stories and rebuilding healthcare in pursuit of a system that is careful and driven by kindness. Continue to watch this space for details on how you can host a book club discussion of your own in your community.! And if you want to share your story, we're always listening. This poem was submitted by Jonathan Richards, FRCGP, Visiting Professor of Primary Care, University of South Wales, written in response to reading Why We Revolt. The Patient Revolution team is grateful to Jonathan for allowing us to share his beautiful words. I caught sight of a retired teacher, known for twenty years. Our lives imprinted one into each other, life’s lines crossed. in the hollow above the collarbone of her young son. have missed it had I not been paying enough attention. teacher, known for thirty years, for Home Communion. might have died if I had not checked his blood, in case. tested. His kidneys were failing; they were caught in time. A transplant has saved him; now a father of three. theirs: mothers, sons and following generations. changing directions, finding doors open and new roads. becoming entangled for a time. Or for ever. Discontinuous wefts compacted into patterns. From Jonathan - I served the people of Merthyr Tydfil, one of the most deprived and unhealthy communities in England and Wales, as a Family Doctor from 1981-2015. I have always had an interest in what happens when people meet with a doctor or nurse. I was a Clinical Director, responsible for quality and service improvements in the National Health Service from 2010-2016. I have been learning to write poetry and was a Masters in Writing student at the University of South Wales in 2015-2017. It was in my mind as I arrived at the experiences in this poem and in my mind as the poem arrived a couple of hours later. After putting the words down, I was struck by how ideas from the Primo Levi poem 'To My Friends' had arrived. I have now reconsidered my life's work as a partnership with my friends. When you're meeting with your patient, or your clinician, does the computer feel like a blessing or a curse? With electronic medical records implemented in most practices, the omniscient and ever-present screen can get in the way of productive and meaningful conversation. A challenge to both patients and clinicians is to retain the human connection during visits while also updating and maintaining the electronic health record. A recent publication from The Gold Foundation - Turning foe into friend: Leveraging the electronic health record to promote humanism - highlighted a study with strategies to help improve patient/clinician communication while promoting and engaging with technology. Part of the approach included the HUMAN LEVEL (see table below), which includes suggestions like making the first few minutes of the appointment technology-free, nixing the screen when it comes to discussing sensitive information, and maintaining eye contact. Patients, have you had clinicians that practice these sorts of strategies? Do you feel like it was helpful? Clinicians, do you try to follow these kinds of guidelines? Does it work? And as a team, would this kind of approach improve communication? Stepping outside of the intimate interaction between patients and clinicians, what could clinics and hospitals do to achieve some of these HUMAN LEVEL goals? Is there something that EHR companies could do to contribute? We'd love to hear your thoughts. Email us at submissions@patientrevolution.org or connect through Facebook or Twitter.